Perfect for supplements, feed, and seed. Durable plastic design, built to last - Built-in graduation marks for easy measuring. 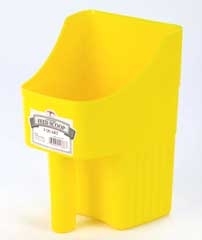 Designed to easily scoop feed out of a bag without spilling, the enclosed scoop can be used for a variety of tasks around the farm and home.